Harriett Lucinda Goble was born 29 Oct 1839 in Alexander County to Lewis Carlan Goble and Evi Hefner and was called "Lucinda". According to the 1850 Catawba County Census, Lucinda was living in Catawba County with her parents, Lewis & Evi, as well as her younger siblings (David, John, Martha, Mary and Caroline). She was 11 years old at the time. By the 1860s Lucinda Goble was living with her parents on their large farm in Catawba County. The life of ease and tranquility had diminished with the onset of the Civil War. The young men were off fighting in the war while the women, children, and old men were left at home to carry on the best they could. The farms were lying fallow and food was getting harder to come by. Supplies were going to the army and civilians were having a hard time. They had to make do with what they had. 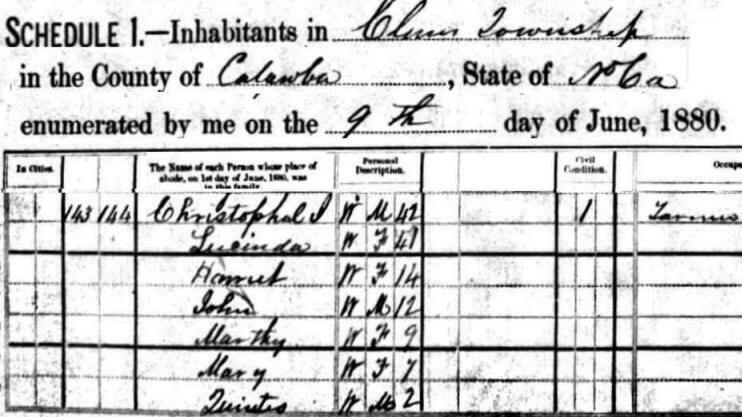 According to the 1860 Catawba County Census, Lucinda is still single and living at home with her parents and other siblings. 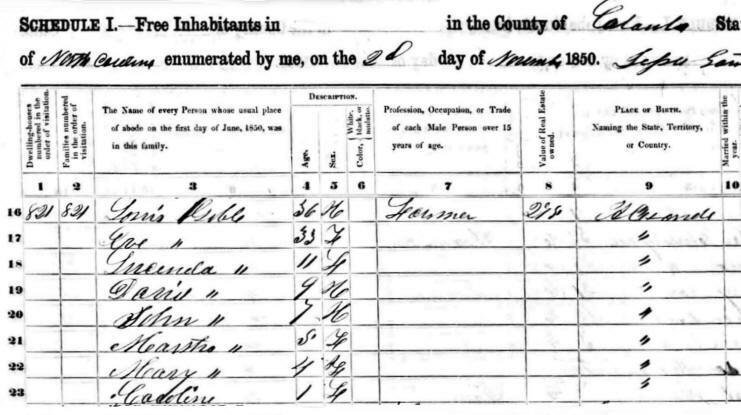 The absence of Caroline from this Census suggests that she has died sometime after the last Census. Lucinda was no different from any other young woman since the beginning of time. She had dreams of love and romance and the man that she would someday share her life with. But due to the hardships of war, the beautiful Lucinda fell for the charms of a much older neighbor by the name of Jacob B. Hedrick. She became pregnant and gave birth to a child that she named Jacob Hedrick Goble on 22 Oct 1860. It appears that Jacob B. Hedrick, who was born about 1802. He would have been about 58 when Jacob Hedrick Goble was born. Jacob Hedrick was the son of John Hedrick and Louiza Lovi. It does not appear that Jacob Hedrick ever married, and he seems to have been in-and-out of the area over the years. There were several bastardy cases brought against him through the years, including a case in 1861 with Lucinda Goble and again in 1866 with Susan Shepard. The 1870 census shows Jacob Hedrick, age 68, living in Catawba County, North Carolina, with Alfred & Matilda Pope close to the Lewis Carlan Goble Family. The census indicates that Jacob had "no occupation or property". Lucinda’s child, Jacob Hedrick Goble, was raised by Lucinda's father and mother, Lewis & Evi Goble. Around 1865, Harriett Lucinda Goble married Andrew Jackson Christopher, the son of Andrew Christopher and Bettie Sigmon Christopher of Catawba County, NC. Jack was born 17 Feb 1839. Lucinda had at least ten children according to the 1900 and 1910 Catawba County Census records. We know about the seven she had with Jack Christopher (Harriett J., John C., Adolphus M., Martha E., Mary Louvanda, Quintus, George Washington) and the one she had with Jacob B. Hedrick (Jacob Hedrick Goble) but there is no record of the other two. 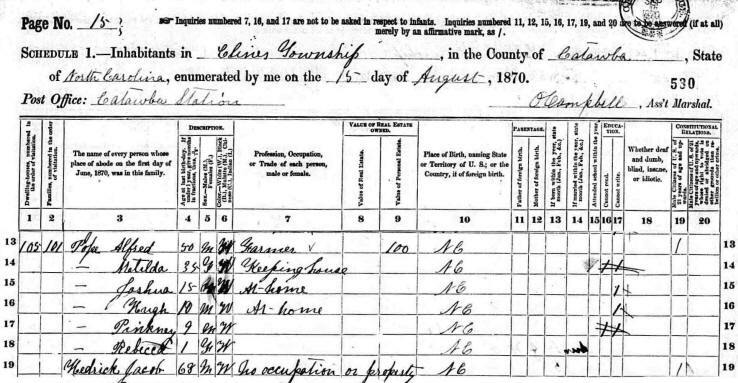 The 1870 Census shows Jack and Lucinda Christopher living in Millers Township of Alexander County, NC. They were both 31 and had three children: Harriet J. (age 4), John C. (age 2) and Alolphus M. (age 1). Jack was a farmer. According to the 1880 Census, Jack and Lucinda Goble Christopher had moved and were living in the Clines Township in Catawba County, NC, with their five children: Harriett (age 14), John (age 12), Marthy (age 9), Mary (age 7) and Quintus (age 2). Jack was 42 and Lucinda was 41. 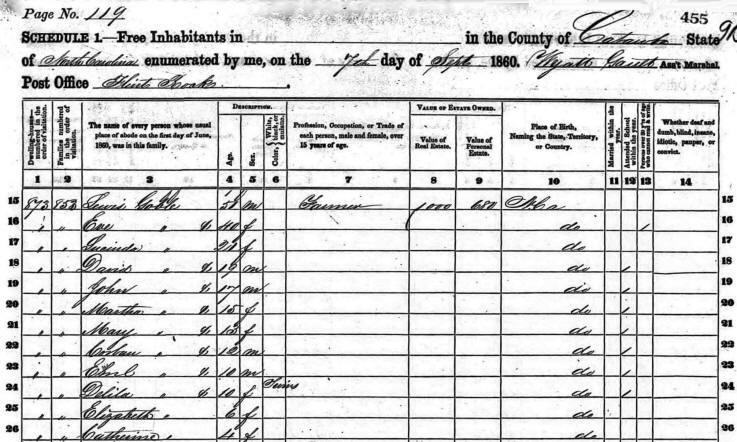 Apparently son Adolphus, who should have been 11 years old, had died since he wasn't listed on this Census. Lucinda and Jack Christopher lived in Newton, Catawba County, NC, during their later years. The 1910 Census shows Jack and Lucinda (Andrew & Harriett L. Christopher) living in the Newton area of Catawba County, NC. 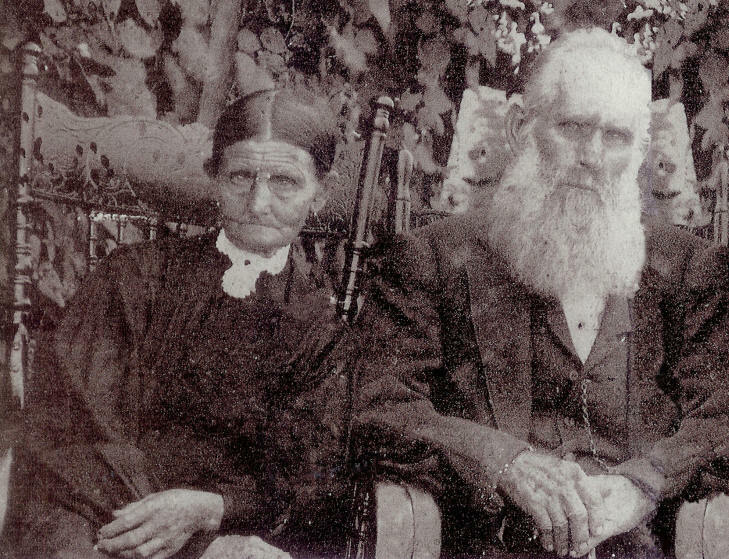 Jack (age 71) and Lucinda (age 71) were living in a rented house - not on a farm as they had been in 1900. The Census once again indicates that Lucinda had given birth to 10 children but only 7 were still living. Only their eldest daughter, Harriett (age 44) was still living with her parents and was working as a "spooler" at a cotton mill. Harriett was still single and her daughter, Lottie Shook, had married Vance Yount and left home. Harriett Lucinda Goble Christopher died 03 Jul 1911 in Catawba County, NC. After Lucinda's death, Jack married Elizabeth Moose in 1912. Elizabeth was the daughter of John G. Moose and Nancy Mock Moose. 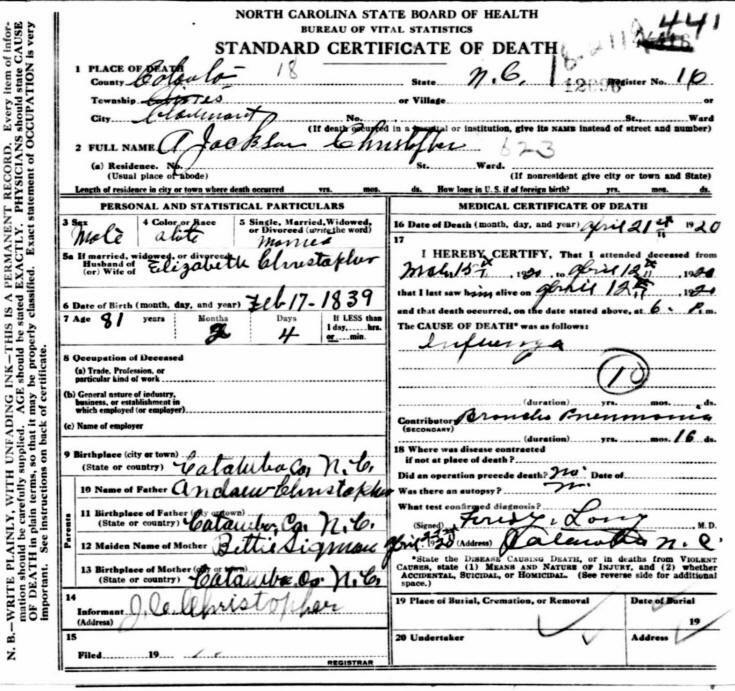 Jack Christopher died 21 Apr 1920 in Catawba County. His Death Certificate lists the cause of death as "Influenza" with pneumonia being a contributory factor. He was 81 years old at the time of his death. Dr. Fred Long what his doctor. Lucinda and Jack were buried in Division B of the Eastview Cemetery in Newton, NC. Their daughter, Harriett L. Witherspoon, is buried beside them. Elizabeth Moose Christopher died 28 Dec 1946 in Taylorsville, Alexander County, NC. She was buried at Macedonia Baptist Church in Alexander County, NC. Mr. George Washington Christopher died at 9:30 Wednesday night at his home near Catawba Station. He suffered a stroke of paralysis last Saturday and his condition had been critical since. A native of Catawba County, he was born January 28, 1881, a son of the late Mr. Jack Christopher and Mrs. Lucinda Goble Christopher. He was married to Miss Ellen Hedrick of Catawba County who survives. 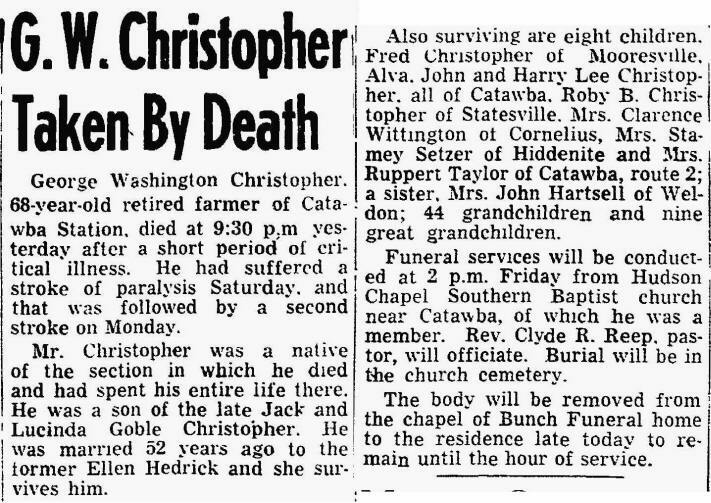 Mr. Christopher lived all his life in his home in the County of Catawba and engaged in farming until five years ago when his health forced him to give up active work. In addition to his wife, he is survived by eight children; Messrs. Alva, John and Harry Lee Christopher of Catawba; Mr. Fred Christopher of Mooresville: Mr. Robey B. Christopher of Statesville; Mrs. Clarence Whittington of Cornelius; Mrs. Stamey Setzer of Hiddenite and Mrs. Rupert Taylor of Catawba, Route 2. One sister survives, Mrs. John Hartsell of Weldon, 44 grandchildren and nine great-grandchildren. Funeral services for Mr. Christopher will be held from Hudson Chapel Southern Baptist Church near Catawba at 2 o'clock Friday afternoon and interment will be in the family plot in the church cemetery. The church pastor, Rev. Clyde R. Reep, will conduct the services. Pallbearers will be grandsons of Mr. Christopher: Messrs. Zeffie, R. B., Boyce, Allen, George W. Christopher and Eugene Martin. The body will be taken from Bunch Funeral home late this afternoon to the residence in Catawba. If you have additional photo or information on Harriett Lucinda Goble, please contact me. A special thanks to Boyd & Becky Goble for the photo of Harriette Lucinda Goble Christopher.